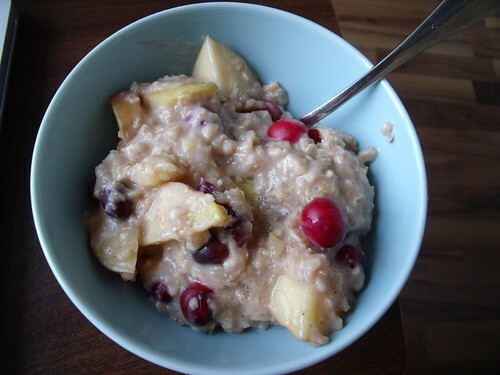 I have had way too much fun playing around with oatmeal lately — and the latest combination is perfect for the holidays: apples, cranberries, and cinnamon! Yum! I’ve added in some maple syrup and vanilla for a touch of sweetness, and this is one of my favourite oatmeal combinations yet. I think I’m going to be making this one for the rest of the holiday season! In a small pot over medium-low heat, combine all ingredients. Heat for 5-8 minutes, or until oats are fully cooked. 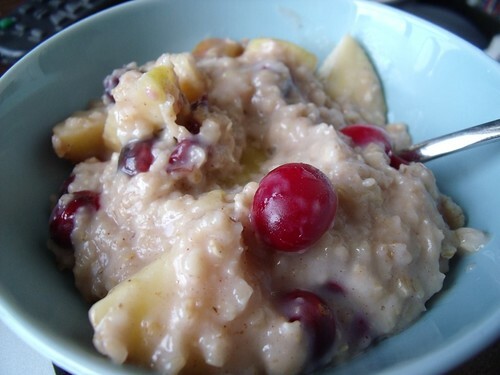 I still LUV porridge for breakfast & I doubt that will ever change…just finished some this morning with a sliced apple, vanilla extract, cinnamon, plain yogourt & sliced almonds….Yummo!! Usually throw in some dried cranberries as well, but ran out then remembered I still have some fresh one…thanks Linz! !